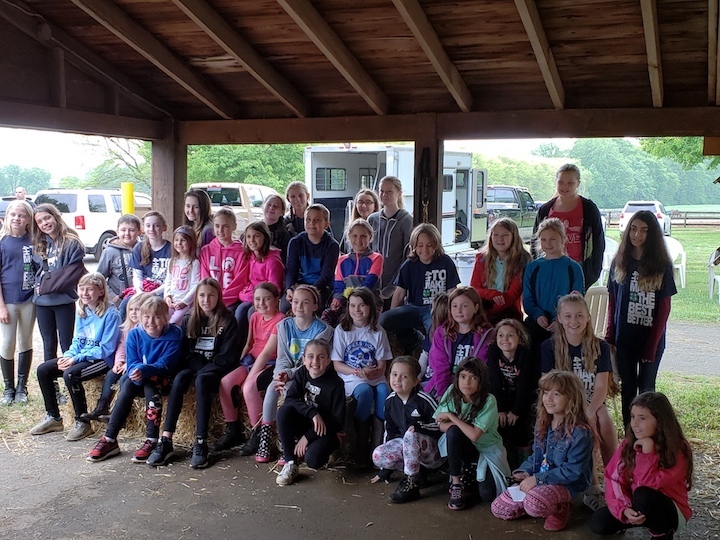 CREAM RIDGE, NJ — May 14, 2018 — May 12th, from 1 pm to 3 pm Fair Winds Farm hosted an equine event for youngsters from the 4-H and scouting community. Approximately 60 youngsters and parents attended. The first hour was a presentation by the Harness Horse Youth Foundation. Ellen Taylor, Kati Eick, and Travis Ceppaluni and his Standardbred Let's Elope, gave a harnessing demonstration. Attendees were also introduced to equine careers and learned about drivers' colors. The second half of the schedule, attendees met driver and trainer Stacy Chiodo. Also with Stacy was Maggie Romano with her Standardbred, Wicked Business. They showed racing equipment and discussed the harness racing business. Attendees were excited to take a tour of Fair Winds Farm, with Mark Mullen and Suzanne D’Ambrose. Facts about mares and foals were also discussed, as they walked along the fields filled with active mares and foals. And an overview of the breeding farm operation was given by Mr. Mullen. The tour ended with Dr. Patty Hogan giving a presentation and tour of her equine medical clinic. She explained the different types of medical equipment and their uses. The finale of the day was a giveaway of a complimentary week at at HHYF camp at Gaitway Farms. One attendee from Allentown,NJ was the winner who will be announced at a later date. Photos courtesy of Mark Mullen and Suzanne D’Ambrose.